When you invest in hydraulic hose assemblies, you need to ensure that all of the correct materials and procedures have been followed before you implement it in the workplace. This is where the best of the best in stockists come to the fore as they are well aware of how much effort needs to go into precision cutting so you can be assured of nothing but the most refined in hosing solutions. Hydraulic hoses and fittings are available in a variety of bore sizes which range from ¼” to 2”. 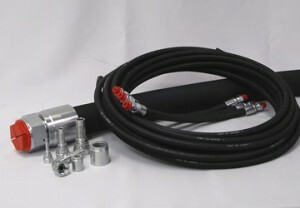 Matching a hydraulic hose against the necessary specifications can ensure that it can resist any number of pressures. Before they are shipped, extensive testing is done on each product and makes for maximum efficiency. Hydraulic hoses are graded by pressure, temperature and fluid compatibility. They are high pressure reinforced industrial hoses which carry fluid to transmit force within hydraulic machinery. This type of machinery was first used in industrial applications in the early 1940’s when engineers discovered hydraulic systems were more compact, lighter in weight and self-lubricating. A hydraulic hose in made in three parts: An inner tube carries the fluid. This is then reinforced with a sheath of braided wire, spiral wound wire or a textile based yarn. A third protective outer layer provides protection from weather, abrasion, oil or chemicals. The advantages of hydraulic hoses range from the capability to turn forces from a few ounces of pressure into hundreds of tons of output. In addition, with the use of this hose type hydraulic machines can create powerful low speed torque and manage the speed and movement of machines with extreme accuracy. This type of hose can customised to meet your specific requirements for your application. Should an outage occur, any good stockist will be able to send personnel out to you to gauge its effects and what the next course of action should be. All hose assemblies that are supplied by Buckley Industrial comply with the Pressure Equipment Directive (EC/97/23).